They are active throughout the community doing good deeds, volunteering at food banks, manning tables at craft fairs, working concessions at movie nights for young children, or packing Christmas boxes for needy families. That’s what is expected of those in an international service organization founded more than 90 years ago. 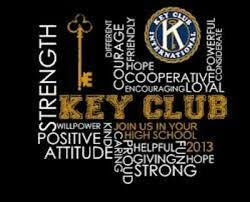 That’s what is expected of those who are members of Key Club. At Messalonskee High School, Key Club boasts a membership more than 50 students strong, according to Club advisor Susan Perrino. Perrino said her expectation is each member has to provide at least 10 hours of community service, but some do far more than that. Jean Ponitz of the Oakland Food Pantry has worked with many Key Club students over the years and has found them to be extremely helpful. Based at the Oakland Sidney United Methodist Church, the Food Pantry is a charitable operation that provides food for the needy from 4 to 6 p.m. every Thursday with the exception of Thursday holidays. Perrino said for her students the value of Key Club goes beyond the good feelings generated from doing good deeds. What also comes into play, she said, is learning to deal with a diverse cross-section of the community – from young children to families struggling to put food on the table. Ponitz sees this firsthand. Her student volunteers, she said, mature dramatically through their interactions with the people who come to the food bank. They have to deal with adults who sometimes have extreme anxiety issues or ones who might be embarrassed to come to the Pantry, she said. “I think it is a very valuable lesson for them in having to think beyond themselves, to know there are people less fortunate than they are – to just give back,” Ponitz said.